Can I add print watermark to page turning book? Q: I plan to turn my works in PDF format into page turning e-publication, and I wanna add a copyright notice as print watermark so as to protect my copyright when someone print the book. Can Page Turning Pro for PDF do this for me? A: It is sure that Page Turning Pro for PDF allow user append custom print watermark to page turning book, and Print watermark will only show in printed page turning book. Print watermark is very useful when you want to protect the copyright of your book or apply as advertisement to advertise your company and so on. Before you learn to add print watermark, you should know well that Page Turning Maker software only support print watermark file in image and swf formats. Step 1 : Run Page Turning Pro for PDF and add PDF for conversion. 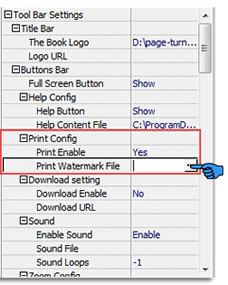 Step 2 : Search Design Setting box for option of Print Config, then check "Yes" to option Print Enable and select a file via Windows file browser as Print Watermark. Step 3 : Click "Apply Change" button to confirm previous setting.